• Ex-Met Francisco Rodriguez has 19 saves, one shy of Sergio Romo’s MLB-leading 20 with the San Francisco Giants. 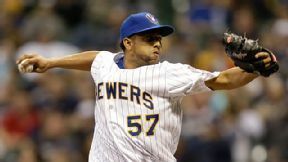 K-Rod produced a four-out save Sunday as the Brewers beat the Pittsburgh Pirates, 1-0. It marked his first save exceeding one inning since June 9, 2011 with the Mets against Milwaukee. Francisco Rodriguez recorded his 323rd career save Sunday. Rodriguez has 323 career saves, which ranks 15th all time. Next up: Roberto Hernandez at 326. K-Rod re-signed with Milwaukee on Feb. 7 for $3.25 million, with the potential to earn another $550,000 in performance bonuses. He did not pitch in the Cactus League until March 15 because he stepped on a cactus. • Catcher Jonathan Lucroy is tied with Yasiel Puig for second in the National League with a .335 average, trailing only Troy Tulowitzki (.361). Lucroy has 23 doubles. He is on pace for 58, which would set a franchise record. Lyle Overbay had 53 doubles in 2004, during his first stint with the Brewers. • Shortstop Jean Segura moved to the leadoff spot on May 22, with ex-Met Carlos Gomez switching to cleanup. Segura ranks second in the NL in runs scored since the change with 14. Teammate Khris Davis, a left fielder, has a league-leading 16. • Aramis Ramirez returned to the starting lineup as the DH Wednesday and then at third base Friday after spending three weeks on the disabled list with a strained left hamstring. Mark Reynolds played third base in Ramirez’s absence. • After unsuccessful talks with the Mets regarding Ike Davis, the Brewers have pieced together first base this season with an ex-Yankee duo: the righty-hitting Reynolds and the lefty-hitting Overbay. They are hitting a combined .213 (66-for-310), but also have 15 homers and 45 RBIs, including Reynolds’ production at other positions. Reynolds’ 13 homers are tied for fourth in the NL. • Right-hander Tyler Thornburg, whom the Mets reportedly sought in a potential trade for Davis during the offseason, has landed on the disabled list with right elbow soreness. Right-hander Mike Fiers was promoted from Triple-A Nashville. • Kyle Lohse had been 17-5 with a 2.80 ERA over his last 34 starts before surrendering eight runs in five innings at Pittsburgh on Friday. The ill-fated start lifted his season ERA from 2.60 to 3.27. • Gomez is hitting .307 with 12 homers, 35 RBIs and 11 steals in 231 at-bats. The excitable Gomez served a three-game suspension in mid-May for his role in a bench-clearing brawl at Pittsburgh. He also had helped incite a brawl against the Atlanta Braves last season. • Second baseman Rickie Weeks is batting .381 (24-for-63) since April 25. • Ryan Braun missed the final 65 games of last season after negotiating a suspension related to his Biogenesis involvement. Braun admitted via a statement last August to using a “cream and a lozenge” to rehab a 2011 injury. He has batted second in 14 of the past 15 games. He exclusively had batter third the previous three seasons. Braun is third on Milwaukee’s all-time home run list with 220, trailing Robin Yount (251) and Prince Fielder (230). • Left-handed reliever Will Smith, who was acquired from the Kansas City Royals on Dec. 5 for outfielder Norichika Aoki, has a 0.94 ERA in 32 appearances. Lefty batters are hitting .135 (5-for-37) against him this season. Fellow lefty reliever Wei-Chung Wang is the 11th Taiwanese player in MLB history, according to the Elias Sports Bureau. He debuted in the majors at age 21, becoming the youngest player ever to appear in the majors from that country. 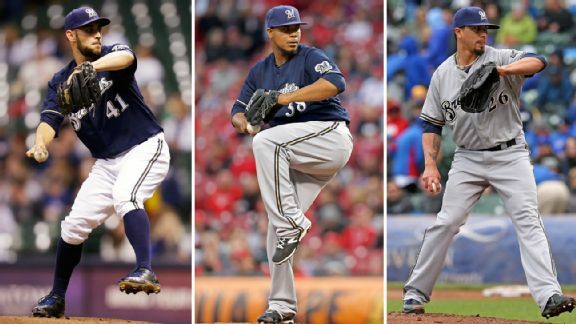 • Matt Garza signed a four-year, $50 million contract with the Brewers on Jan. 27 after splitting the 2013 season between the Chicago Cubs and Texas Rangers.